When you go camping or have an emergency, you will want to keep smaller electronics such as your cell phone, radios, tablets or laptop charged. These portable/ foldable panels come with USB and cigarette plug-in. These make it easy to keep your electronics charged. Just unfold in a good sunny area and plug in. This is one of the best foldable panels I’ve found. I’ve also bought a cigarette universal power adapter to be able to adjust voltage to other electronics. There is usually more than 12 volts coming from the cigarette adapter so it’s important to have a charge controller or a voltage adapter in between solar panels and electronics. Electronics are made to run off a 12 volt system so anything more can damage it. The USB plug ins are ready to go so you don’t need to worry about a charge controller with that. Just plug in and go! 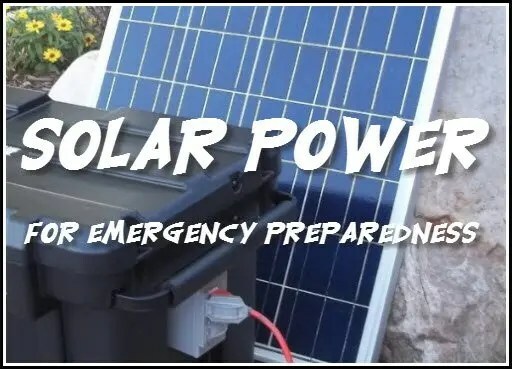 If you would like to get something that can run bigger or more electronics, then you will want to get a solar generator. You can buy many sizes of solar generators so first you will want to get an idea of what you plan to use it for. Then you will want to consider your budget since these systems can run anywhere from $500 to $5,000+ depending on what you want to run. There are companies such as Humless and Goal Zero that have “All In One Units” ready to go. These can be good for some people, but if you are able and willing to build your own unit, you will get so much more for your money. The basics of a solar generator is Solar Panel -> Charge Controller -> Battery-> Inverter. Let’s first start looking at what items you may want to run. 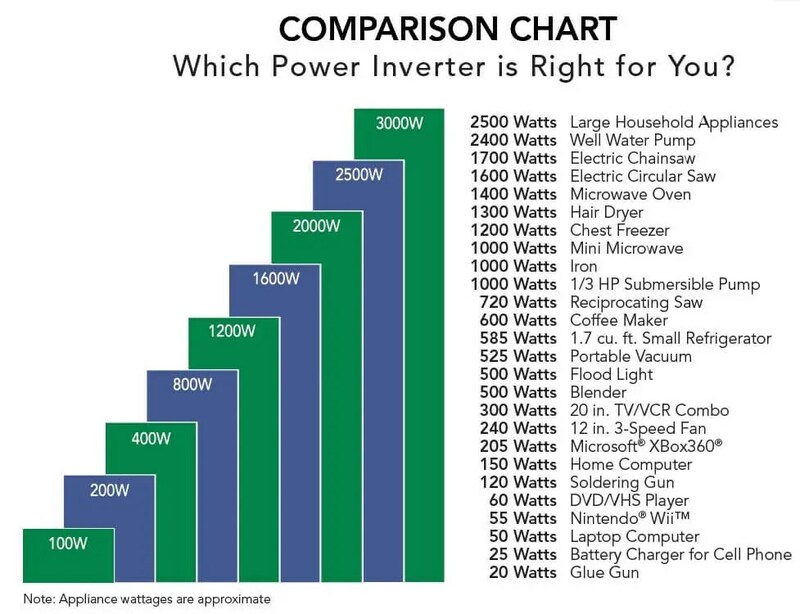 Look at the chart below and make a list of item and wattage. Now that you have your list, you need to find the biggest wattage on the list. This number is what you’ll need as you look for an inverter to plug in your appliances. Be mindful that appliances have a peak wattage that usually happen on start up or during a certain cycle like a fridge. It may say 2000 watts but peak is 4000 watts. So you’ll want to get what your appliances need. Now you’ll want to figure out what the amps are for each device. Divide the watts and the volts together to get your amps. (W / V(12) = A) Example: 80 watts/ 12V = 6.7 amps. You will want to add up all your amps for each appliance to find out the batteries you’ll need. Also one thing to remember is you’ll want to recharge your batteries at 50% discharge. I like to do it at a 70% discharge since it will increase my battery life and avoid damaging the battery. You should never fully deplete the battery. I have a 155 amp hr battery and if I plan to recharge at 70% then I need to figure out my actual run time. 155 x 0.7 = 108.5. Now 108.5 – 155ah = 46.5 amps is what I’m actually going to use before my next charge. 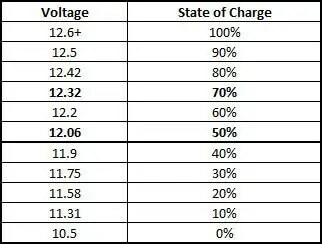 If I were to go to 50% discharge then I would have 77.5 amps to work with. I wouldn’t go down any more than that in your calculations. Now that you have your total of amp hrs you’ll need, you can now look at batteries to see how many and how big you need to get. If you have 46ah of actual run time in a battery then you can look at it this way. One 100 Watts Panel for every 100 amp hr battery would probably be the minimum to charge your batteries in a decent time frame. With solar panels you want to look at the amps that are coming in to see what your recharge time will be. Most 100 watt panels are about a 5 amp charge to the battery per hour. So if you have used your 46 amps and want to recharge, then you are looking at about a 9 hrs to recharge your battery with one 100 watt panel. If you were to get TWO 100 watt panels then your charge time goes down to 4.5 hrs (approx). Now this is on a good sunny day so if there is some cloud coverage it will take longer. So the more panels the faster the charge time. This system will give me around 3 days of use before needing to recharge for what I have planned. I plan to use one battery as the other is charging, so I will have power all the time but if there were a few days of bad weather I can still have a buffer of a few days before I run out of power. The cost of the basics in my set up not including some of the other meters in the pics would be around $1300. I’d recommend some volt meters to check batteries discharge rate and an amp meter coming in from the solar panels to see what you are getting to figure out recharge time. I hope this gave you a good start in getting into solar and I wish you all the best in your solar projects!